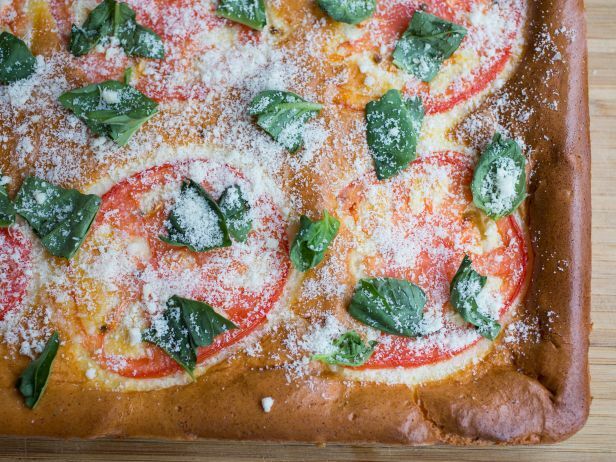 If you're looking for an easy grain-free bread that is packed with protein, try this simple recipe for cloud bread. With the tomatoes, Parmesan and basil it makes a great side dish. Omit them and you have bread for deli sandwiches and hamburgers. Dovetailing Tip: Put tomatoes and basil on half of the pan of bread. Use this half with today's meal. The other half, store in a sealed container. When ready to serve with the Baked Spaghetti, place on a baking pan and heat in 350° oven for 10 minutes until crispy and warm. Serve with the Cheeseburger Soup for Meal 5. Preheat an oven to 350 degrees F. Line a quarter baking sheet (1" x 9" x 13") with nonstick foil, then generously oil the bottom and sides of the pan with oil. Set aside. Beat the egg whites, cream of tartar and salt in a large bowl with an electric mixer on high speed until the mixture becomes shiny and stiff peaks form, about 2 minutes. Beat together the egg yolks, garlic, cream cheese and agave nectar in a separate large bowl on medium speed until completely combined and smooth, 2 to 3 minutes (the mixture may appear broken but it will come together after a few minutes). Gently fold the egg whites into the egg yolk mixture until combined, making sure not to deflate the egg whites and keeping the mixture as light and airy as possible. Pour the batter into the prepared baking sheet and top with the sliced tomato. Bake, rotating the pan halfway through, until the top is deep golden brown and the bread bounces back when touched, about 20 minutes. Cool completely on a wire rack and store in an airtight container overnight. Before serving, drizzle with oil and sprinkle with flaky sea salt, the basil leaves and grated Parmesan; cut into squares.